What was this Fire Seminar about? We were pleased to be able to attend the Devon and Somerset Fire and Rescue Service (D&SFRS) Seminar November 2018, which was held at the Fire Service HQ on Tuesday 13th November 2018 in collaboration with IHBC South West Branch and Historic England. 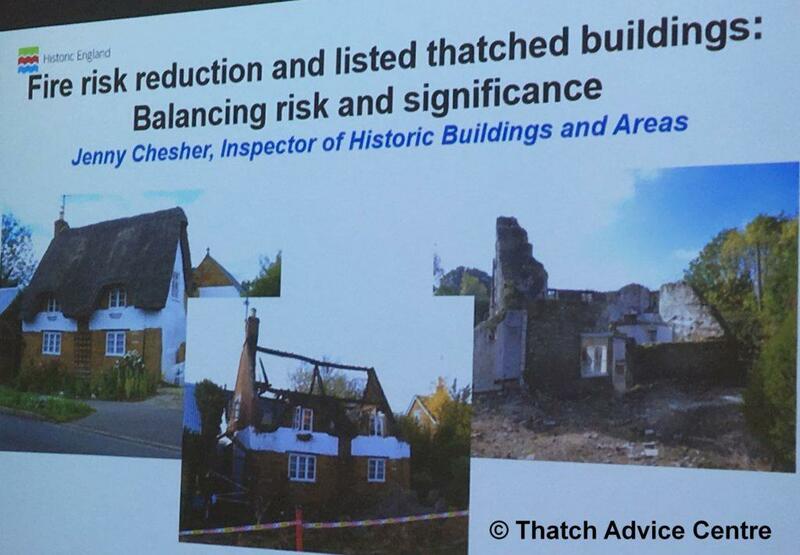 The title of this Seminar was “Reducing the risk of fire in thatched buildings: recent research and new guidance”. 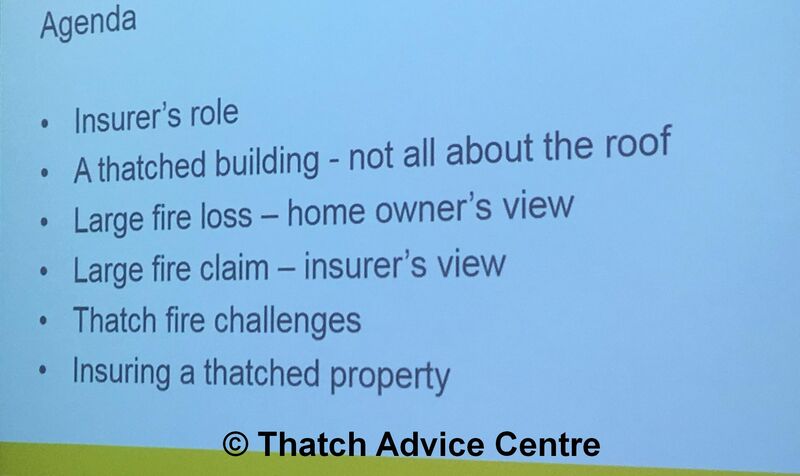 We promoted this event and were happy to supply copies of our updated Thatch Fire Safety Leaflet (which incorporates the advice from this recent research and new guidance). There were 60 delegates attending and, we understand, a considerable waiting list. 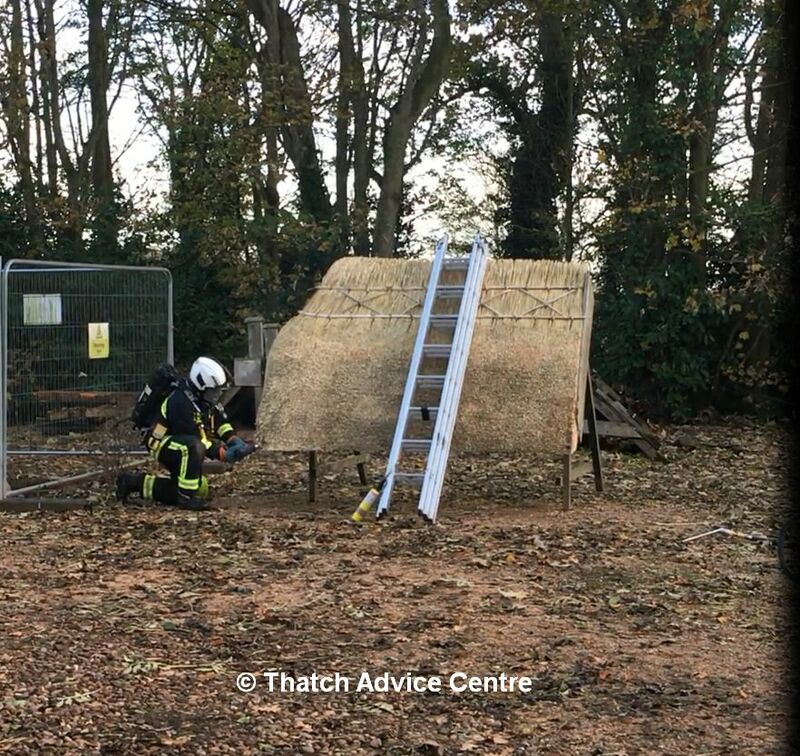 New Guidance on reducing fire risk in thatched properties. All speakers gave excellent presentations which then generated useful and further illuminating discussion. We have below given a brief overview of each. 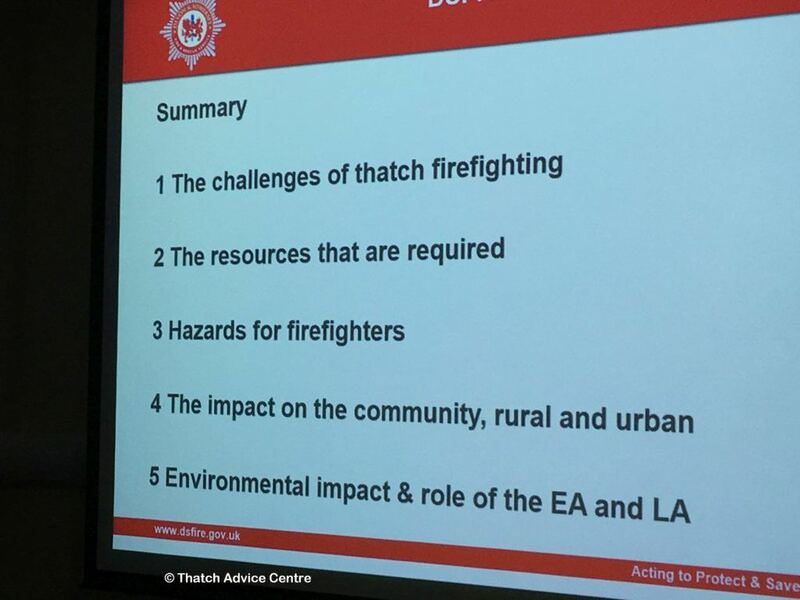 Alan Gilson gave a clear explanation of the financial cost to the Fire and Rescue Service based on thatch fires being very resource intensive. This was followed by clarification of their aim to reduce the number of incidents and therefore the costs to D&SFRS. He concluded that the purpose of this event was to work collaboratively to reduce the number of fires as all attendees were there with common goals. As a large thatch property insurer, the NFU explained the specific challenges. These challenges not all being about the roof, but also to do with type of building, rebuild costs and heritage salvage. Strong emphasis was put on the biggest problem being underinsurance at valuation. The need for homeowners to understand their responsibilities for adequate insurance, as well as understanding and complying with insurers’ terms and conditions, was confirmed. Information was given on the process after a claim and explanation of timescales and work involved in reinstatement/ rebuilding. Alison Henry gave a detailed overview of the values of old buildings to society and how these values are damaged by fire; not only financially, but also in terms of aesthetic, communal, historic and archaeological evidence. This moved on to information on the 1990s research into the Heat Transfer theory which had in turn sparked specialist discussion due to a large majority of fires which could not be explained. The findings from Keith Benjamin (Burgoynes) Forensic Investigation Report on the causes of thatch fires were then clearly covered as being the starting point to the 2014 FPA research (funded by Historic England and NFU). This important, thorough and ‘fresh-eyes’ look at ignition research was summarized succinctly by Dr Jim Glockling. He explained that thatched fires are rare and not easy to re-create in a lab and that the research was complex due to there being a lot of factors at play. These include timescales, method, insulation methods, heat transfer considerations along with mechanisms for fire raising. Everyone was given a better knowledge of the research done. The next steps were also mentioned as there are always more questions. It was wonderful having everyone on the same page working together, discussing the issues and looking at improvements in the care of our thatched and heritage thatched properties. References to where delegates could find and read the research and guidance were given (obviously including our website) and we were thanked for our promotion and the Thatch Fire Safety Leaflet. Dr Glockling then presented the FPA Guidance on reducing the thatch fire risk for people with woodburners. Jenny Chesher gave an excellent explanation of the decision making process on Listed Properties and planning issues, with emphasis on chimney height. This was very comprehensive and confirmed that each case should be assessed on its merits. A clear presentation into the challenges of thatch firefighting, resources, hazards, impact on the community (both rural and urban) and environmental impact was given. Thus highlighting the importance of reducing the number of thatch fires, which is the aim of this seminar. 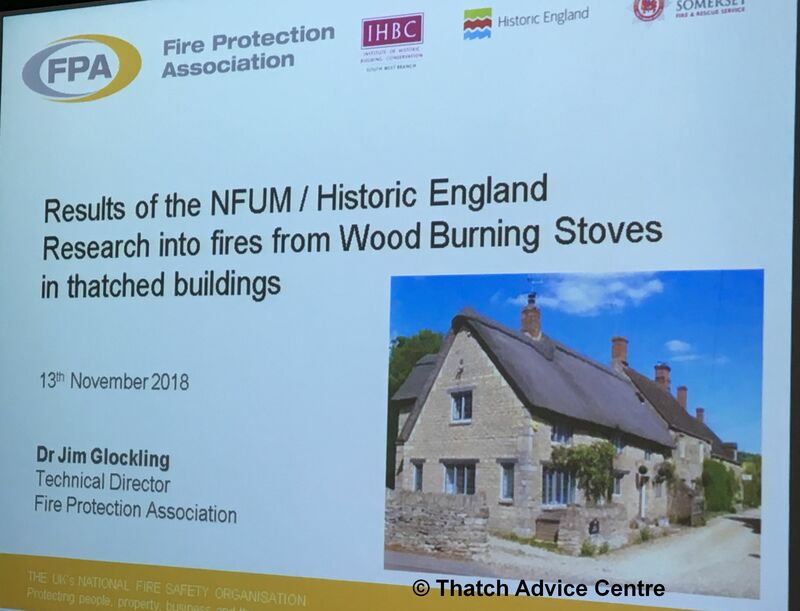 These speakers gave interesting and, for us, additional information regarding the process and procedures involved after a thatch fire in a listed thatch building, from a building control and conservation perspective; from bracing walls, protecting remains, dealing with forensics to reports and planned reinstatements. They also highlighted the importance of pictorial evidence in conservation and time spent in the immediate aftermath helping with the staged completion process. Nigel Bunce Master Thatcher had prepared a great thatched rig. Compressed Air Foam System (CAFS) and extinguishing methods were demonstrated to an interested crowd of delegates. 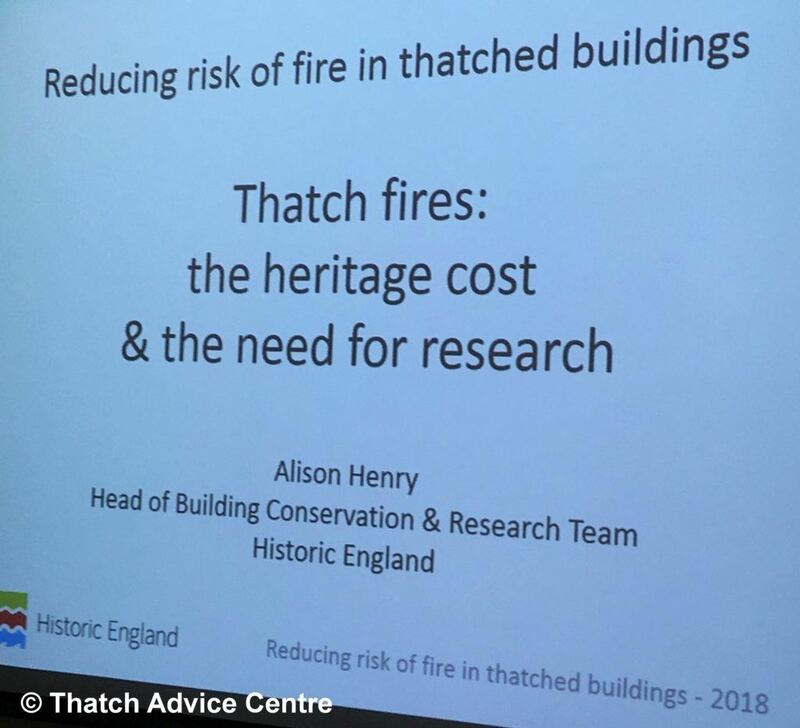 Thanks to everyone involved for such an informative and positive day in promoting and discussing the up-to-date research and thatch fire safety advice with emphasis on our thatched heritage. Working together at its best. 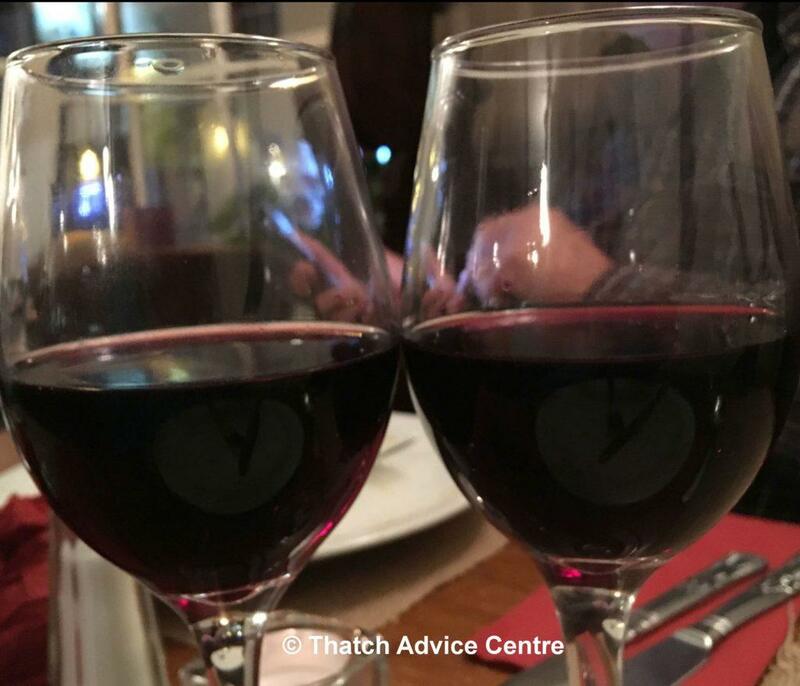 It was a long and constructive day, finished of by a well deserved glass of wine!